impressive...i love all the carvings around the side...great choice jm! A fountain worthy of its name! I feel the spray of the water in your first shot. A very impressive and grand fountain. Wonderful sculpture work around the edges. I, too, wonder about all the carvings. The waterflow seems to vary quite a bit?? Every square or park should have a fountain such as this! What a fabulous theme - fountains! This one is magnificent with the circle of symbols surrounding the main fountain pool... great focal point and it looks like you captured the second shot at sunrise, or was it sunset. A lovely fountain in a spectacular setting! Wha a lovely fountain. I can almost hear the roar of the water and feel the spray! 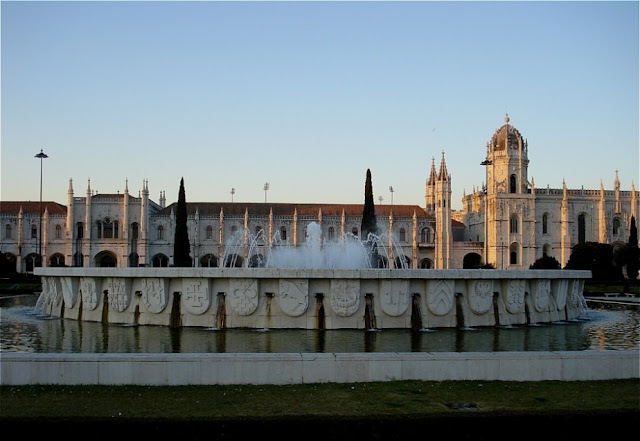 This is a great pairing of photos, worthy of the magnificence of the Jeronimus Monastery, one of our favorite memories of Portugal. 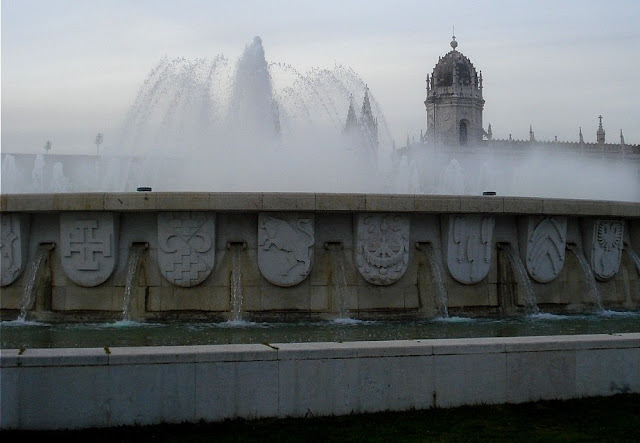 An elaborated and beautiful fountain with a fantastic background. Just too beautiful, the Mosteiro dos Joronimos!! It is huge, and beautiful. The warm light on the monastery in the background is lovely. You have so much beautiful ART around you! What a place, what a fountain! The first picture is a stunner! Já nem me lembrava que havia aí uma fonte em frente dos Gerónimos! Essa fonte é maravilhosa!óptima escolha! And all that on a beach!!! A beautiful fountain. I love all the heraldic details on the side of the basin. I almost posted this fountain as well. But it's not in Barcelona! Maybe on another blog. Wonderful fountain! This is such a great theme for CPD! Super shot. And that monastery makes a fantastic background for any photo! Lovely light, too! JM, this is a remarkable, elegant fountain. Your photos are so well composed. Nice job. That is one amazing fountain! We 've been there!!! :) How nice!! I love the idea of posting fountains!! The top shot is my pick.